As MCCN seeks to grow and to meet the future needs of healthcare, making sure learning technology adapts for faculty, staff and students is essential. For this reason, MCCN will transition over one year to a new learning management system (LMS) called Canvas starting this summer. Mount Carmel College of Nursing (MCCN) welcomes Melanie Dreher, PhD, RN, as speaker at 2015 Commencement, to be held Saturday, May 9 at noon at Grove City Church of the Nazarene. Dreher is chair of the board of trustees for Trinity Health, parent organization of Mount Carmel Health System. Currently serving in a number of healthcare governance roles, Dreher also is a member of the Chicago Board of Health, a director of Wellmark/Blue Cross Blue Shield and a trustee of Loyola University. Select high school sophomores and juniors from Columbus City and South-Western City schools gathered at MCCN on Saturday, March 21 for the first ever Explore Nursing program. Mount Carmel Health System recently announced a $700 million expansion that will encompass Mount Carmel East, Mount Carmel Grove City and Mount Carmel West. As part of this expansion, a $355 million investment in Mount Carmel Grove City will expand the one-year old facility to a full-service hospital by 2018. In doing so, Mount Carmel Grove City will be the first hospital in the market south of the Interstate 70 corridor and will greatly expand access to care for a rapidly growing part of central Ohio. After construction is completed in Grove City, Mount Carmel West's inpatient operations will transfer to Grove City and the West campus will undergo a $46 million transformation. The Rho Omicron Chapter of Sigma Theta Tau International, the Honor Society of Nursing, will be hosting a special afternoon tea on Sunday, April 12 at 2 p.m. in the College Lounge. The admission fee of $25.00 at the door will benefit Twin Valley Behavioral Health, which provides recovery-based, comprehensive, quality, cost-effective mental health services to adults with a severe mental illness in a secure inpatient setting. Register online at this link. Penny Marzalik, PhD, APRN, program director for MCCN’s new Doctor of Nursing Practice (DNP) program and associate professor, talked with The Carmel Rapper about the new online degree that begins this fall, with classes starting August 17. The Rapper: What is the DNP degree? Dr. Marzalik: The Doctor of Nursing Practice (DNP) is the terminal – or highest level – degree for the nursing profession. 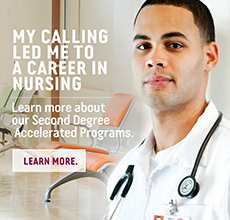 The DNP is a nursing practice degree that’s an alternative to a PhD, which has a research focus. Read more: What’s It All About? As part of our ongoing series of profile faculty, staff and student representatives, this month we feature Assisant Professor Dale Hilty, PhD. Come Out and Support the MCCN Nightingales Softball Team!